I wrote the following piece before heading out for work at 6am Monday morning and thus I was so utterly cream crackered by the time I arrived home, that I passed out on the couch, only waking up when the phone rang at 6.30pm to find out if I was coming around to the stadium for the FA Youth Cup quarterfinal. Needless to say, it was 15 mins after KO before I eventually made it around to entrance S, with Cardiff having just scored an equaliser. I was amazed to see that people were still streaming into the stadium. The club had only opened the lower tier, but as the West side of the ground filled up, they gradually opened up additional blocks and having found the seat that was being held for me by my mate, behind the goal at the South end, even after I arrived, the blocks behind the goal at the opposite end of the ground were still filling up, to the point where eventually a crowd of about 10,000 (total guess) completely filled about 60 per cent of the lower tier. It was great to see that so many had turned out to watch the youngsters. Perhaps time was a factor, as I was surprised that the club hadn't done a little more to publicise the occasion and I was concerned the crowd might end up looking a little sparse in a huge cavernous empty stadium. Especially after I'd originally been told by an AFC steward after we'd beaten Bristol at Underhill, that the quarterfinal was perhaps going to take place immediately following the first eleven's match with Wigan, which would have been great as I am sure many thousands would've stayed to watch the youngsters. However this might have meant that all those who turned out last night, who aren't season ticket holders, wouldn't have been able to get in and this would've been an absolute travesty. One of the best things about such occasions and especially this particular one, is that with entrance prices only 3 quid for adults and a quid for kids, there were literally thousands there last night who, whether it be for financial reasons, or the lack of availability of tickets, have probably not been able to see the first team play live and undoubtedly, for many this will have been their first opportunity to get to see a game in our magnificent new stadium. Although it also saddens me seeing the cosmopolitan make-up of the crowd last night and the vast numbers of young children who were present, as this is pretty damming evidence that there are huge sections of Arsenal fans who have now either been priced out of Premiership footie, or who are denied watching the Gunners regularly for one reason or another. I absolutely detest the Mexican Wave, as I find it an unnecessary distraction from events on the pitch. However there were hundreds of kids sitting around us last night who were getting a great kick from jumping up and down and generally joining in and having a great time and I always find myself thinking it's a crying shame that so many of these kids don't get to spend quality time with their folks on a regular basis, watching their heroes play live, in the way I was fortunate to do as I grew up. What's more, on Saturday I was contacted by a mate on the mailing list an hour or so before kick off, as he had a spare ticket and didn't want to see it going begging. Andy knew that I occasionally take the lad who lives in the flat downstairs to games with me and he very generously asked if Jamal would like his spare ticket. For many years, the Arsenal have had just about the most cosmopolitan crowd in top flight football, with a reasonable mix of races and creeds of all colours and types. Nevertheless, walking around to the stadium with Jamal, to meet Andy, as we headed up the stairs and across the north bridge, amidst the huge throng, I couldn't help but notice that the faces of those around us were predominantly white. Despite the fact that they'd only opened up about a quarter of the stadium last night, you still had to queue for the duration of the half-time break, if you wanted to be served with anything to eat or drink and I can't help but think either the club, or Letherby & Christopher are shooting themselves in the foot, missing out on a substantially increased revenue from refreshments as a result of either not being able to serve people quickly enough, or because so many of us just do not have the patience to spend so long in a queue for such expensive crap - which reminds me of the old jewish bloke asking for the manager in a restaurant, because he has two complaints. "The food tastes like crap! And the portions aren't big enough"! But if you can be bothered to spend the entire break queuing, then with hot-dogs and programmes, it has got to cost well over a hundred quid to take a couple of kids to a game, that's assuming you can get tickets and so this inevitably means that the Arsenal is going to become an increasingly elitist club, where for the vast majority of your average Joes, it's going to be a once in a blue moon treat. Meanwhile, after dining on their Raymond Blanc, Michelin starred meal before the game, the 120 odd members of the Diamond Club are given a flask of hot chocolate to take out on to the "terraces" and then they are served little mini-hamburgers in their seats at half-time and after the game, when they have to wait half an hour for the crowds to clear, before they can drive their cars out from the car park under the stadium! Now if only just a little of the incredible attention to detail that has gone into impressing all these Gooner high-rollers, had been diverted towards the problems of an ever ageing audience and some socially responsible schemes to make the Arsenal more accesible to young kids on a regular basis. 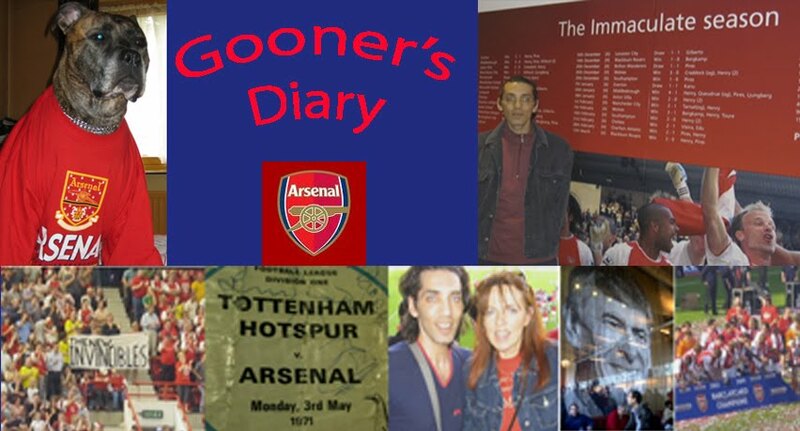 Even from a less sentimental, strictly financial point of view, it would surely be a sensible move to take more measures to try and regenerate our crowd with fresh blood, merely based on the amount of merchandising bought over the course of their lifetime by every newly introduced youngster to the Gooner faith? As it turns out, since starting this overly long preamble, I've actually stopped to endure an awful performance against PSV, where unsurprisingly we heard Arsène roll out his stock excuses after the game about where we "dropped physically" and "suffered from heavy legs". I am afraid this just doesn't wash with me and to be honest I am tired of hearing Arsène blame tiredness, as some of his players look a little more exhausted every time he repeats this mantra. What I want to know is where was the intensity in our performance right from the KO, for the first hour of the match, when we did have fresh legs. Instead of which we played to PSV's very limited strengths (at least going forward - their keeper and the centre-backs had a good night) and from the laidback, almost lazy way we went about this game, it was hard to believe we were actually playing for a place in the quarterfinals of the most prestigious tournament on the planet. Like many others I'm sure, I texted my mates in Eindhoven at half-time, to express my fears that it was going to take a PSV goal for us to really get going. However that is where mental fatigue really took it's toll, as although we've managed to come back from the dead more times than I care to remember this season, we always knew that there was going to come a game where we couldn't manage this sort of rescue mission. I am afraid tonight was the night, as with the home crowd buoyed by taking an utterly unexpected lead, suddenly for the first time all evening PSV began to gain some confidence and stroke the ball about a bit. Whereas by contrast you could positively sense the energy levels draining from the Arsenal and as we struggled to find any momentum, when we tried to change up a gear, for the first time sadly the tanks were so empty that we were running on fumes alone. I knew Wenger would never take such a risk, but I actually wondered if Theo might have prospered better in such circumstances, where he might have had more room to do the business with PSV dropping back to defend and where he could have gained a head of steam, without having a player up his jacksey every time he receives the ball (as is likely to be the case if he plays against Chelsea). Then again, I thought Baptista might also be more impressive in a European environment, with more time on the ball, but he was bloody anonymous when he came on as sub, so shows what I know! Just as someone commented on Saturday, we simply couldn't afford to carry so many under par players tonight. After being out for so long, Willie Gallas couldn't possibly be match fit and from what I saw, he was a yard short of the sort of pace necessary to do any damage going forward. I am unsure if Aw had any other options, but if he was insistent on including Gallas, I would have preferred to see him replace Senderos and use a younger, fitter, more energetic player at full-back. Fabregas seems to have been struggling for form, ever since we had those amazing few days when we did for the Scousers and Spurs. It l;ooks as if our dependence on Cesc in every game early in the season, is beginning to catch up with him. And now he's suffering from the sort of vicious circle, where the less he's able to influence the game because of his mental and physical fatigue, the more frustrated he becomes and the harder he toils, with increasing ineffectiveness! To my mind Thierry Henry hasn't been right all season. Usually you'd expect Thierry to be caressing the ball into the back of the net but a lack of confidence appears to be affecting his all important first touch. What's more, while Titi still has oodles of pace, just about his greatest asset is his turn of pace, where moving at what you assume to be full speed, Titi suddenly finds another gear, the turbo kicks in and suddenly his opponent looks like he's going backwards. When was the last time we saw Thierry ghost past a defender with the afterburners set to warp speed??!! However it wasn't really a night for blaming individual performances as I can't really think of a single Arsenal player who had a good night and basically we were incredibly lacklustre all round. Obviously this is only our first defeat and we should really be holding our tongues until we see if we can turn it around in the second leg, instead of suddenly sticking the knife in at the very earliest opportunity. However the one thing which really struck me when watching on the box tonight, is that it is hard to picture anyone in or around this Arsenal squad who is capable of winding everyone up before such a big game, to ensure that right from the kick off, they start the game with such hunger and commitment that we see them really going for the throats of the opposition. Unfortunately it would appear from what we've been watching all season, that the only way this side can be motivated, is by the perceived sense of injustice of going a goal behind. Additionally I have mentioned it briefly below, in my comment about the Valencia manager, but I am of the opinion that we must always start with our best available eleven. Lee Dixon made an interesting comment on Match of the Day the other weekend, when he revealed that often Arsène rest tired players even before they realised they were tired. I assume AW studies the statistical data and I can't help but wonder if he's a little bit too dependent on it for deciding on whether his charges are so fatigued that there's a higher possibility of them going out and getting injured if he doesn't act upon the info and rest them. Yet while the data might not lie, personally I believe it simply cannot count for the essential ingredients of confidence and mental state, which can only be judged on instinct. As a result I'm a firm believer that a winning side doesn't feel anywhere near as fatigues as one that's been beat and so I reckon you maintain a winning line-up for as long as possible, resting players where possible, only after we've managed to go two goals up. Fortunately I was fully intending to travel to Eindhoven, until I was offered work Tues, Weds, Thurs and by turning down Tuesday, I'd end up losing out on the best part of five hundred quid for all three days, as the bloke found to replace me on Tuesday would continue working the other two days. However it wasn't purely a financial decision (although you could add at least another hundred quid as the likely cost of the spends on a boys day out), as I didn't want to leave my WHU supporting gaffer in the lurch (as he's more than enough on his mond at the mom). As it turned out, I consider myself very fortunate, as I had far more fun on Monday night than I would've had in Eindhoven and right now I'd be struggling to stay awake on the long schlep home, or perhaps struggling for sleep, to find some solace in my dreams :-) and it only ended up costing me three quid instead of over £600 !! Yet as enjoyable a game as it was, watching the youngsters progress to a semifinal v Man Utd or Brum, they weren't particularly impressive against Cardiff. As far as I'm aware Marc Randall was the only player who wasn't involved in the penalty shoot-out win in the last round against Bristol and I fully expected to see Randall run the show against a gritty, workmanlike, but far less talented Cardiff side, demonstrating why Wenger saw fit to take him and Traore along on the pre-season tour of Austria. Traore didn't play in the last round either and I imagine we missed his boundless energy on the left flank, à la Gael Clichy (BTW can anyone confirm that "Guy-el" is the correct French pronunciation of our full-back's first name, rather than "Gayle" as I've been screaming "allez Gayle" ever since he's been at the club and it would be great to know I'd got it right - it would also be interesting to find out if anyone has actually read this far :-). Sadly along with Fran Merida and Nacer Barazite, Randall was very disappointing and it was only Jay Simpson, with his well taken hat-trick, who made much of an impression on the night. Defensively we were a bit of a disaster, conceding equalising goals almost immediately after we'd scored our first and then again after the second. Also I can confirm that it's absolutely correct that we play the same style of football throughout the club, from Stevie Bould's lads, to the first team, as on Monday night it was no less frustrating that we lacked any real width on our large pitch and I could've just as easily been watching the first XI, as we constantly tried in vain to plough a furrow through the heart of the opposition's defence, with our tippy-tappy passing patterns all too often floundering on the substantial (in number and size) Cardiff bodies. Sunday’s bore draw against Blackburn was the absolute antithesis of the thrilling entertainment we enjoyed up at Bolton last week. Yet I suppose if the Arsenal served up such footballing caviar twice weekly, it would soon taste like smelly fish eggs! Despite the sort of profligacy from the penalty spot that made for an incredibly stressful evening for every Arsenal fan, there were several instances of artistry in our interplay at the Reebok, that will have been appreciated by all genuine lovers of the beautiful game. When the seemingly interchangeable components of this Gunners’ squad are truly on their game these days, the breathtaking results are pure poetry in motion. But then that’s probably been our biggest problem so far this season. We either tend to blow lightning-white hot, or lukewarm to the point of being tepid. The latter was certainly the case on Saturday, in a game played at such a slow tempo, that I had to keep nudging the missus to ensure she wasn’t nodding off! If I was partial to a conspiracy theory, I might surmise that a sneaky Blackburn supporter must have slipped a large dose of Bromide into the tea, that the Arsenal were invited to take with Her Majesty at Buckingham Palace on Friday. Or perhaps they were mistakenly served from her old man’s teapot, where sedatives are ‘de riguer’ to prevent the senile old bigot from causing yet another international incident? Personally I prefer watching arrogant winners any day. Yet according to the farcically overblown comments in the media about the recent contretemps involving our lot, these hacks would have us believe that the Gunners are in need of a crash course in graceful losing. Cesc Fabregas might make like a doyen with a ball at his feet, but he only has to demonstrate a teenager’s (healthy?) disrespect, or Thierry Henry’s halo only has to slip slightly, for us to be perceived as a bunch of arrogant larrikins, lacking in the necessary humility to take a few punches in a bout of blame acceptance. Whereas in truth we are no more guilty of hubris than any other side with designs on greatness and if it were any other way, we’d be moaning that it didn’t mean enough to them. Naturally I wouldn’t want to let the side down, so I’d place the Beeb top of my finger-pointing list, as partially culpable for Saturday’s lame performance. Sadly the FA Cup is the last bastion of live football on terrestrial TV and as such, the BBC seems desperate to squeeze every last drop of live coverage out of their lonely baby. At least I assume it’s the scheduling demands of the Corporation that are responsible for this recent trend for staggering cup games across the course of an entire weekend. This wouldn’t be a problem, so long as we didn’t end up with the short straw of the much despised midday start. The atmosphere is usually the first victim of these early kick-offs and although our crowd did it’s best to raise the temperature, without the customary couple of hours spent quaffing alcoholic inspiration, there was an overall lack of intensity about this contest, which made it hard to believe that this was an Arsenal side, who’d all grown up watching FA Cup Finals on the box and whose careers had been inspired by dreams of imitating their idols, climbing those famous Wembley steps to collect the trophy. Unbelievably it’s still not 100 per cent certain that Sunday’s Carling Cup encounter with Chelsea will be the last final to be staged in Cardiff. Brent council better get a wriggle on with the two “ramp up “ events necessary for the New Wembley to meet the necessary health & safe requirements. However on the assumption that the authorities involved will eventually make it happen, if only because they don’t want to end up looking like an even greater laughing stock than they are already, then supposedly the incentive of being one of the two teams to trot out onto the latest incarnation of the hallowed turf for the first time, has given an additional edge to this year’s tournament. Or at least this has been the party-line of the tabloid hacks, with their trite requests for players to put into words what it would mean to be a participant in the New Wembley’s grand debut, when so many might have grown up several thousand miles away, where Wembley was something of a footballing myth, apart from the odd glimpse of the Twin Towers on a TV screen. The Arsenal’s desire to reach the final might have been evident in their death or glory triumph at the Reebok. Although I’m more inclined to believe that our extra-time inspiration was borne out of the fact that they were increasingly petrified of joining Gilberto, Baptista and Adebayor as the fall-guys in a disastrous penalty shoot-out. However there was little sign of such a hankering to walk down Wembley Way for at least an hour of Saturday’s vapid showing, where there was such a lack of hunger and commitment that one could be forgiven for thinking that both sides looked as if they might have preferred to have been elsewhere. I’m sure we’d have enjoyed more entertainment pushing a trolley around Asda. At least we’d have been left patting the wedge in our back pockets, rather than paying through the nose for the privilege to watch a performance where, never mind wanting to reach Wembley, I’d have settled for some signs of an interest in earning a win bonus! Mark Hughes might have been delighted in a defensive job well done, but in truth the 6-2 defeat a few weeks back was a far less one-sided affair. After all the energy expended disposing of Bolton and with a prize of a home draw against Man City in the quarterfinals, it will be a travesty if we don’t progress, as there can be no disputing the gulf in quality between the two sides. Yet as the clock ticked down towards the inevitable replay, it wasn’t so much my fear that the trip to Ewood Park could prove to be the proverbial ‘great leveller’ but the abject thought of yet another schlep to the North-West, after a week when we’ll have already clocked up nigh on a thousand miles travelling to Netherlands and Cardiff. By now you’ll know whether Wenger’s rotation of 9 players against Rovers reaped a reward of fresh legs capable of running riot against PSV. Although I can appreciate Arséne’s reasoning, personally I’d much prefer to see us always start with our strongest XI, as was readily demonstrated by the Valencia boss on Sunday, who waited until he was winning 2-0 against Barca, before resting his star players for the midweek resumption of Champions League hostilities. Yet our Carling Cup kids have certainly earned their Cup Final appearance. It would be a blatant lie to say I wouldn’t be any the less gutted if they end up losing to a more experienced Chelsea line-up, but after the revelation of youngsters performances to date, we can take a whole lot more than a worthless trophy from this tournament. Whatever the outcome, I’m hoping that by making a weekend of it in Wales, a win won’t be quite the be all and end all and considering they’ve overcome such increasingly obdurate opponents on route, you never know, the kids might just be ready to beat the Blues?